This canvas is getting hard to find. Imagine the fun things you could do with this canvas. Hand painted Mary Lake Thompson for Melissa Shirley (MLT230) on 13 mesh canvas. Design is 11.4" wide by 22.5" tall. Stored flat in smoke/pet free home. 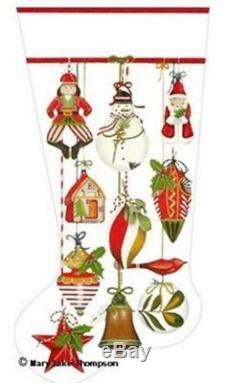 The item "PRICE REDUCED Melissa Shirley Hand Painted Needlepoint Stocking Ornaments" is in sale since Friday, June 29, 2018. This item is in the category "Crafts\Needlecrafts & Yarn\Embroidery & Cross Stitch\Hand Embroidery Cloth & Canvas\Plastic Canvas". The seller is "cocoliaka" and is located in Lakeville, Minnesota.